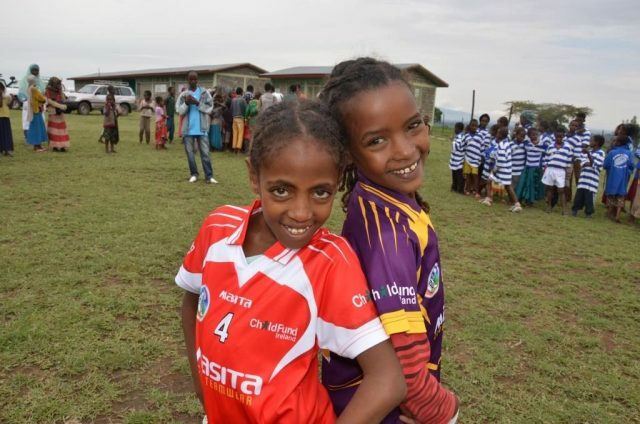 On a field visit to Ethiopia our Child Ambassadors got to meet their own sponsored children, to witness the first batch of girls helped by our Dream Bike campaign, and to bring the great sport of Camogie to local communities! Its Cork v Wexford in Ethiopia! It was a hectic, action-packed first visit to Ethiopia for our Child Ambassadors Aoife Murray and Mags D’Arcy. The girls, who are two of the biggest names in Camogie in Ireland, have put their full support behind our exciting partnership with the Camogie Association. The first fruit of that partnership is the Dream Bike campaign which has a very simple message with a big heart. We want to provide vulnerable girls with the means to get to school safely and regularly – something which we take for granted in the developed world but which is a lot trickier for children in developing countries who often have to walk several miles to get to school. It was with great pleasure therefore that the girls were able to visit Ethiopia to witness the first batch of bikes being distributed to eager school girls in our programme district of Siraro. 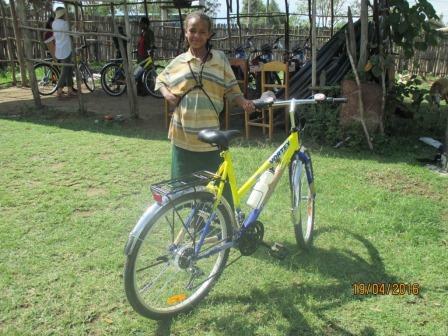 The provision of bikes to needy girls with good grades who live the furthest away from school and are struggling to attend regularly enough to maintain a steady education, is hugely important. To these girls and their families, the bikes represent a form of emancipation that will help give them a chance to complete their studies and realise their full potential. The visit afforded the girls a personal opportunity to meet their sponsor children and get an understanding of the work ChildFund does to help children like these, their families and their local communities, in developing countries across the world. 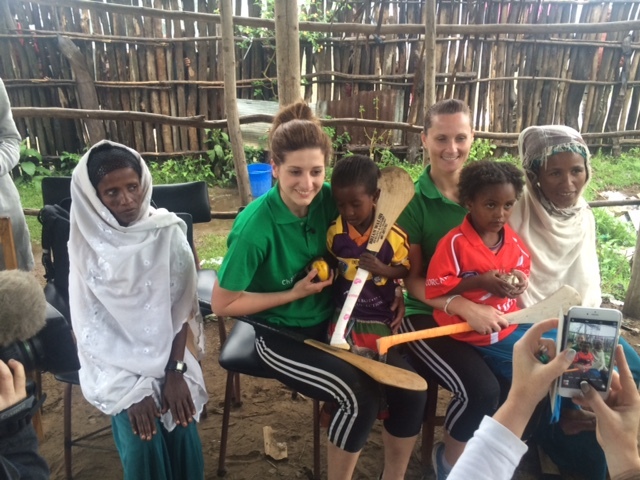 A great end to the visit saw Aoife and Mags introduce local children to the wonderful sport of Camogie. Its a game that has captured the imagination of tens of thousands of girls around Ireland and which might be about to open up a new African chapter! Never before perhaps has the Cork v Wexford rivalry looked quite as colourful and magical as this. The children were kitted out in county jerseys, hurls and slitors and after some coaching by our team captains, were raring to go. The match was officiated by our Chairman Brendan Kenny and was a huge success. 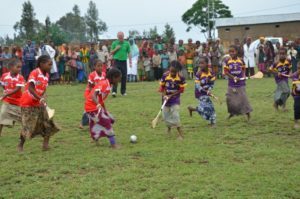 The participating children had loads of fun, and the local community certainly had their curiosity piqued, coming out to watch this Irish sport being played out in their village, in large numbers. ChildFund Ireland would like to sincerely thank all those involved in making the trip happen and all those who have kindly donated to this amazing cause so far. In particular, we would like to extend a debt of gratitude first and foremost to our Ambassadors Aoife and Mags for taking time of work to come out on this visit. Both girls have dedicated a huge amount of their time and passion to supporting and promotion the Dream Bike campaign. A huge thanks also to Brain Walsh Hurley’s of Enniscorthy, Co Wexford for generously supplying Hurley’s, bags and embroidered jerseys, to Cúl Sliotars of Kildare for kindly providing the sliotars you can see the girls using in the picture above, and to Naas Camogie for supplying jerseys. Finally we would like to thank Anne Cassin and all the team from RTE Nationwide for travelling over to Ethiopia to document this amazing trip. Stay tuned to our website and social media channels for details about the programme broadcast date.